Image: Mark Geiger has been assigned to the Week 5 opener at Gillette Stadium this Friday. Mark Geiger will get MLS week 5 under way when refereeing New England Revolution versus New York Red Bulls on Friday night (7pm ET). Logan Brown – new to the PRO roster in 2016 – will be one of the assistant referees at Gillette Stadium, the venue where he made his MLS debut last season. Brian Dunn and Marcos DeOliveira complete the crew in Foxborough. Seven match-ups take place on Saturday, including Sporting Kansas City – the only team with a perfect record after three games – against Real Salt Lake. Ted Unkel was in the center for the Western Conference leaders’ US Open Cup triumph last season, and he takes charge of that one, which kicks-off at 8:30pm ET. The Eastern Conference is currently headed up by Montreal Impact, who visit Seattle Sounders in week 5. 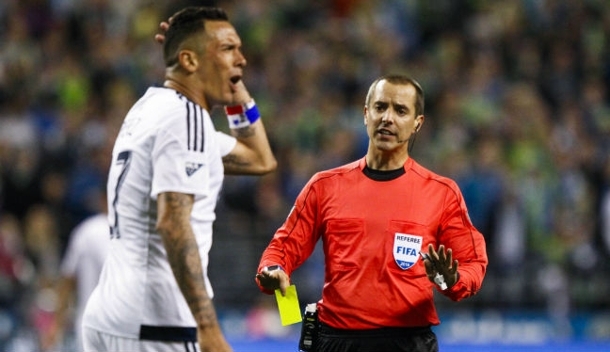 They’ll be officiated by the experienced Baldomero Toledo, who has over 200 MLS center assignments under his belt. Philadelphia Union are tied on points with Impact, and they play Saturday’s first game against Chicago Fire (5pm ET). Phil Briere – a CONCACAF Gold Cup AR in 2015 – runs the line with Gianni Facchini; Silviu Petrescu is the man in the middle at Toyota Park. Ismail Elfath and Jair Marrufo have been handed their third assignments of the new season at Colorado Rapids and Vancouver Whitecaps respectively, while Edvin Jurisevic and Fotis Bazakos are also on Saturday duty – with two new ARs working alongside them. Taking the flag for the first time since reaching the PRO roster are Jeffrey Greeson and Cameron Blanchard, who both debuted last season. Greeson will work with Jurisevic at FC Dallas against Colorado Rapids, while Blanchard runs the line at Avaya Stadium, where San Jose Earthquakes play host to D.C. United. Alan Kelly brings the weekend action to a close when Orlando City welcome MLS Cup champions Portland Timbers to Citrus Bowl on Sunday night. Eric Weisbrod was involved in both the 2015 NASL and USL Finals last year, and he runs the line in Florida with Kyle Longville, while Caleb Mendez makes his first fourth official appearance of the new term.